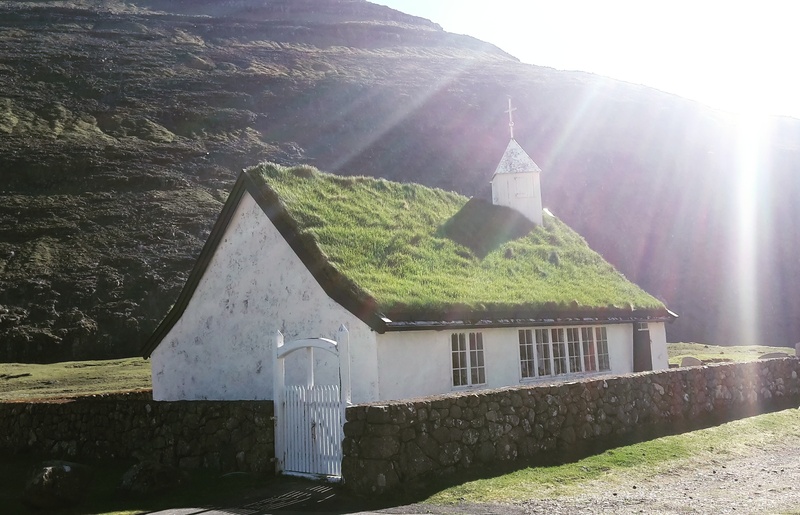 Things you expect when you visit the Faroe Islands: puffins, awesome scenery, grass-rooved houses, and lots of seafood. Sunburns? Nope, not on my to-do list for what is known as one of the cloudiest places on earth! 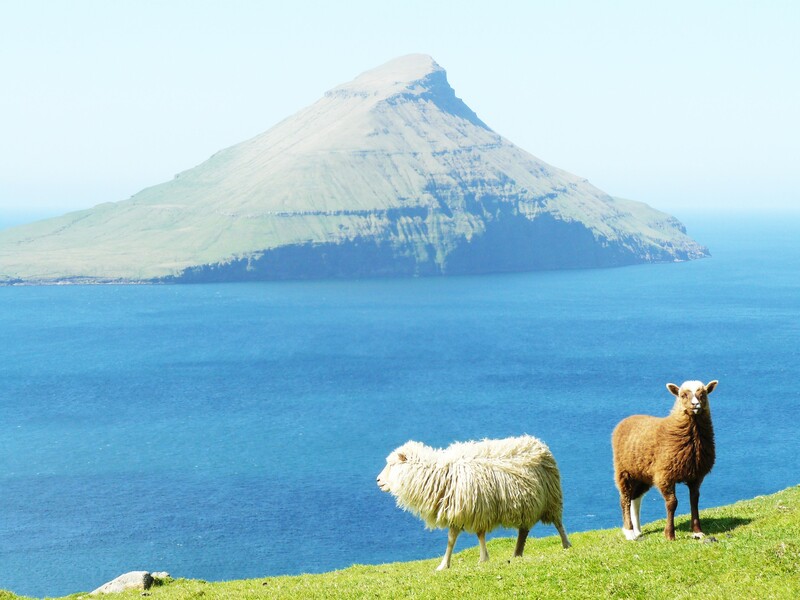 The Faroe Islands are about 200 miles north of Scotland, halfway to Iceland. A volcanic archipelago of 18 islands, they are about as isolated as it gets – 2 days by rough sea from Iceland, 2 days by rough sea from Scotland, or…1 hour by plane from Edinburgh, which is how we slightly more conveniently made our way to Torshavn, its capital ‘city’. The entire country, mostly famous for its occasional football heroics, only has 50,000 residents – half as many as Crawley! 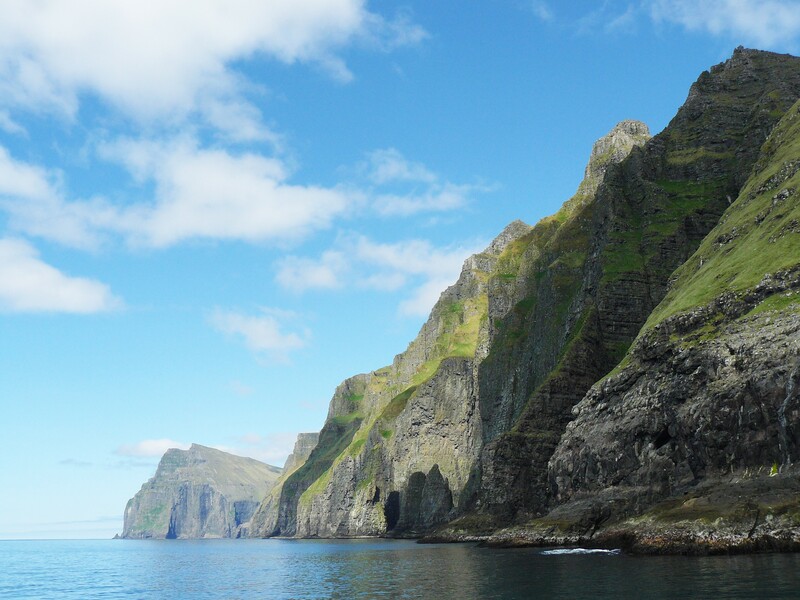 The Vestmanna Cliffs – only three times the Eiffel Tower’s height! The land is barren – think Scottish Highlands but with fewer people, far fewer trees and only a handful of endemic sheep (no midges). Cairns line the rugged hill crests, gently guiding the lone walkers from one village to another. It’s a paradise for hillwalkers, a paradise for bird-watchers. But for runners? Well, actually, yes! 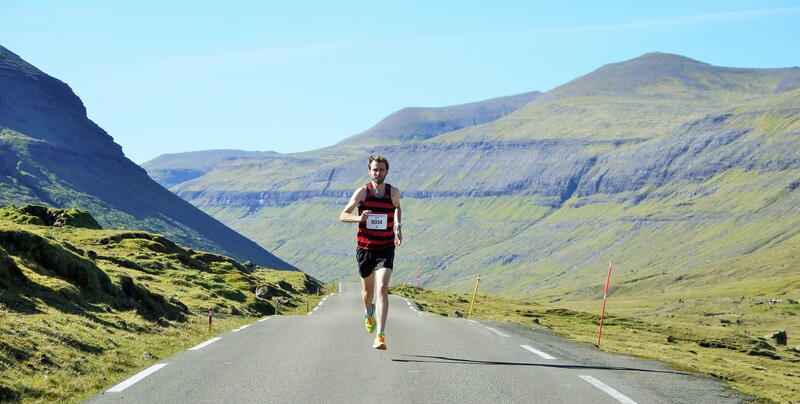 The Torshavn Marathon has been running for a number of years – a small affair, its three races (fun-run, half marathon and marathon) only have 500 or so runners. A third of these are international runners, mostly from Denmark, whose crown technically stills owns the islands. The standard is mixed, and what you’d expect from a small race. However, the previous years’ winning times were decent considering the elevation changes. The islands are steep: no bit of land is ever more than 3 miles from the ocean and the average height of the country is 1,000ft! Its tallest cliffs are just shy of three times the height of the Eiffel Tower! Although the race is on smooth roads, this would be no easy affair. On the plus side, we were there during the driest spell in living memory (about 7 dry days) and, in balmy 15C ‘heat’, we wouldn’t have to suffer from the cold or rain. As all I’d packed to race in was my club vest and shorts short enough to be indecent, that might have been a blessing. 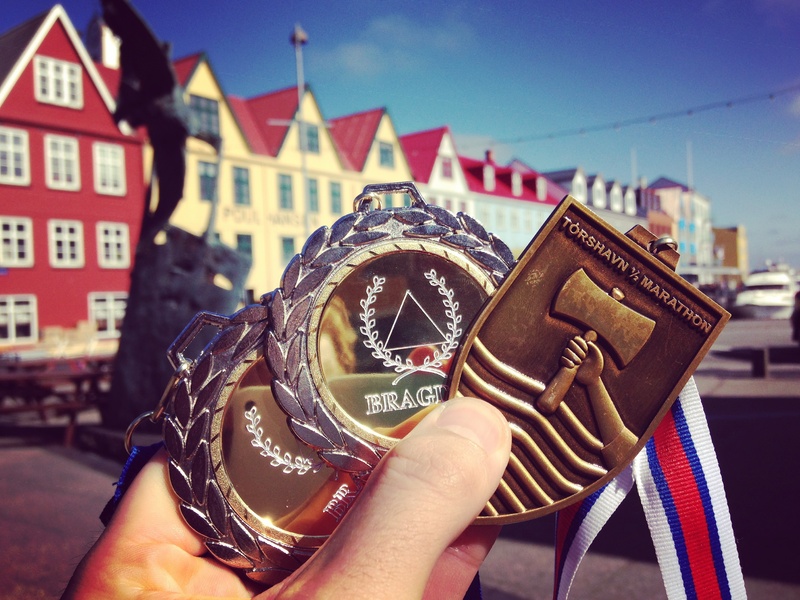 The race starts in Torshavn’s town centre – a small, convivial affair, it’s nonetheless very professionally organised. I’d signed up for the half marathon, aware that 400m of elevation change over that distance is approximately 399m more than I’d ideally want. 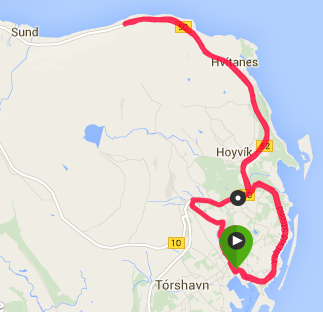 The route was simple: a lap and a half of the city before heading out along the Nolsóy fjord and back. Off we go – Where’s Wally and Dennis the Menace in the lead! The first few hundred meters were downhill, which was ideal. I ended up in the lead for the first kilometre, both to my surprise and to that of the marshals, who after a bit of confused gesturing, got my message that I had no idea where I should be going and they had better tell me! A few thumbs up later and my lead was gone anyway, a local Faroese being much better suited to the steep hills which made up the next 3 kilometres. To my delight, what goes up must come down. And so did I at break-neck speed as I galloped down at my normal 3000m race pace for two kilometres until we went back through the starting area and headed out to town. By now, the leader was extending his lead while I held a good minute or so on a group of runners chasing me down. As we exited the city, we ran along the Atlantic Ocean and into the countryside, where a distinct lack of wind and a beaming sunshine bouncing off the tarmac was making me uncomfortably hot. So much for the “wet, windy, cloudy and cool all year round” Faroese climate and the 260 days of rain per year! By now, the only flat points were the hill crests or valley bottoms. The climbs were gradual but unrelenting; the descents steep (>10 degrees) and slightly shorter. It was nice to pick up speed in these but also worrying that we’d have to run back this way! As we progressed along the fjord, I was very aware that a group was catching me up. My aim now was to make it to the U-turn point after 14km still in second. After that, well, it was fun while it lasted. As I turned, I could hear their steps behind me. Resigned, I looked behind to cheer them along but…they’d disappeared! These runners were running the full marathon and now had a different route. Happy, rejuvenated by the rising breeze and aware I still had my minute lead, I picked up some speed. Although the crowds were essentially non-existent, virtually every runner going in the other direction was cheering me on which was very much in line with the race’s spirit. And then, ahead of me, lay the beast of a hill which I had rushed down only ten minutes earlier. 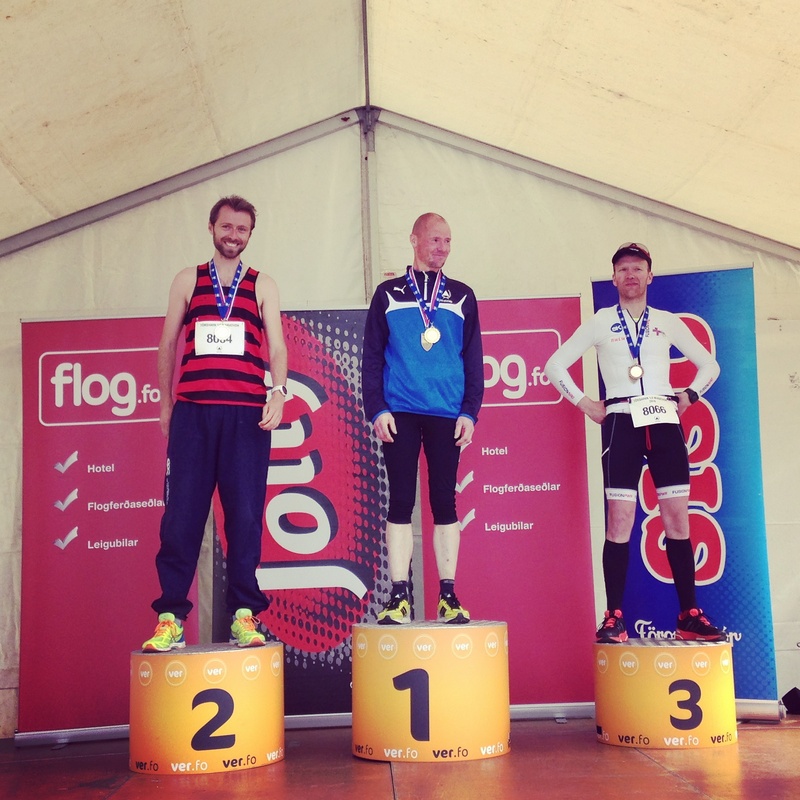 If I made it up in one piece, this podium finish was mine. After an agonising half kilometre – during which I genuinely felt a bit sick, I finally reached the top. My mouth was open – both gasping for air, and with my jaw dropped at the beautifully primal backdrop. 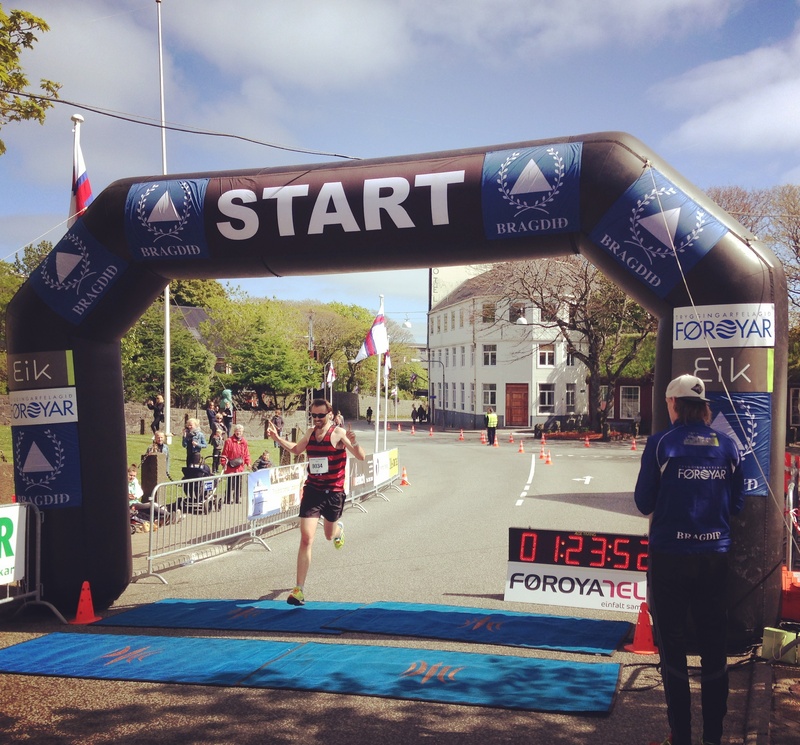 Forget Boston’s Heartbreak Hill, I give you Torshavn’s Calf-break Hill. A few more kilometres and it was now mostly downhill past grazing sheep, turf-roofed and timber-framed houses – painted in defiant shades of red, yellow and blue and locals going wild (not really). I crossed the line in 1h23, a good 3 minutes behind the winner and the same ahead of the third: my first podium! Without dwelling too much on the weather, we lucked out and it was amazing. If you want to relax on the beach after a run, don’t come. If you want to experience a different way of life, get blown away by out-of-this-world, austere, landscapes, take dozens of blurry pictures of puffins then come quick. This little gem of a country is still off the beaten track but it won’t be long before too many people hear about it! Brilliant report. Even looking more forward to the marathon come Sunday.